Contrary to an auditorium for symphonic music, in which the orchestra and the audience occupy the same architectural space, an opera theatre has three different coupled spaces, each with different acoustic functions: the stage tower, the area for the audience and the orchestra pit. Given the importance of the voice in the genre, the sound balance B between the singers on the stage and the orchestra in the pit is considered one of the key factors that determine the acoustical quality of an opera performance . In an opera theatre, the singers are at a disadvantage in comparison with the Orchestra, both in number and in sound power, and the balance B should be maintained within a range of -2 to +4 dB . In the case of the Teatro Colón of Buenos Aires, well known for its outstanding acoustical quality , achieving the proper balance is not easy given its large size: a huge main volume of 20,000 m3 coupled to a stage tower of 30,000 m3. Two different situations have been identified: the main floor and the upper levels. On the main floor, the measurements show that the balance is appropriate, with values of B between 0.7 and 4.7 dB. The analysis in a digital model reveals that these values were obtained from many broadband sound reflections of the singers’ voices on the surfaces surrounding the stalls (Fig. 1), in conjunction with the masking of the sound coming from the pit. Figure 1. (Basso TC 1.jpg) Some of the lateral reflections of the singers’ voice towards the same seat on the main floor, coming unobstructed from the dihedral angles wall/ceiling from three-balcony levels. They help the voice to be heard, and thus, rising the balance of the stalls. As important as the values found of B is the spectral distribution of the balance. A singer trained in the western operatic tradition produces a lot of energy in a range of frequencies centred around 2500-3000 Hz. In this region, called the “singer’s formant”, they can reach intensities well above those of the orchestra . In the Teatro Colón, the stage/pit balance reaches its maximum values in the region of the singer’s formant, helping the voices to be heard clearly (Fig. 2). Figure 2. 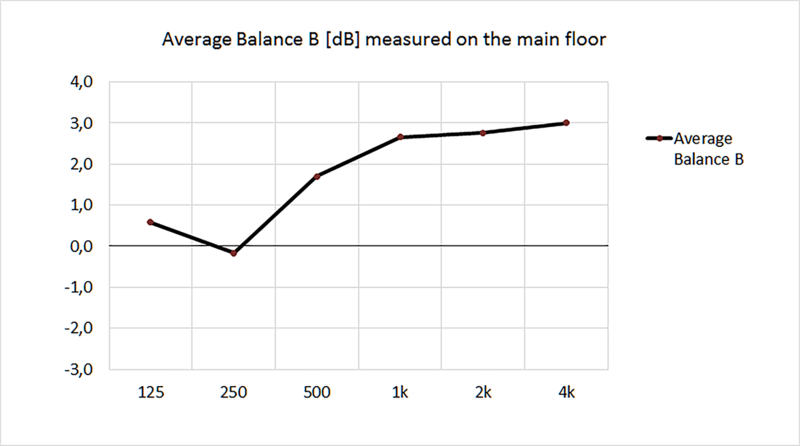 (Basso TC 2.jpg) Spectral characteristics of the Balance on the main floor, in which the frequencies corresponding to the singer’s formant are reinforced and favored by the room. As could be expected, the stage set-up can reduce the balance values on the main floor, mainly if the singer is placed well inside the stage tower. At upper levels, where the instruments of the Orchestra in the pit can be seen, the balance loses part of the spectral advantage it has in the stalls; nevertheless, this situation is compensated by the emergence of the powerful reflection of the singers’ voice on the stage floor, reflection that is almost non-existent on the main floor (Fig.3). This fact, plus the appearance of early reflections coming from the ceiling, allows to maintain the balance within appropriate values at the higher levels. Figure 3. (Basso TC 3.jpg) Early reflections at the upper level (paraiso) from a directional source on the stage. The strong reflections can be seen on both the stage floor and the ceiling. The results of this work allow to understand some of the acoustic characteristics of the Teatro Colón. Those outcomes also enable us to design the set-ups of the operas based on acoustic considerations in order to keep the singer/orchestra balance at high levels, one of the key factors when it comes to qualifying a lyrical performance. N. Prodi, R. Pompoli, F. Martellotta, S. Sato. “Acoustics of Italian Historical Opera Houses”, J. Acoust. Soc. Am. 138 (2), 769-781, 2015. J. Meyer. Acoustics and the Performance of Music, Springer, New York, 2009. T. Hidaka, L. Beranek. “Objective and subjective evaluations of twenty-three opera houses in Europe, Japan, and the Americas”, J. Acoust. Soc. Am. 107 (1), 368-383, 2000. J. Sundberg.J. The science of the singing voice, Northern Illinois University Press, Illinois, USA, 1987.